From the first time someone got burnt from a candle being used in a Jack-O-Lantern I'm sure they wished that there was a safer way to illuminate those frightening faces used at Halloween. Of the many Halloween decorations which I have seen, the ones which were electrically illuminated have always caught my eye first. The Noma Lighting Corporation seems to have been the first company to commercially sell electrical lights for Halloween use. In the late 1920s many of Noma's lighting sets were sold with Halloween uses appearing on the boxes. Noma also promoted Halloween usage in advertisements and trade publications. Figural lights in the shapes of Jack-O-Lanterns, ears of corn, pumpkins, witches, and other Halloween shapes began to appear in the 1920s and 1930s. Some of the figural lights which we now see and assume to be Christmas figurals were actually made for Halloween. In the early 1930s Noma created their first lighted decoration intended solely for Halloween. A string of celluloid pumpkins could be purchased, sold within an orange box covered with black bats and witches. The box contained seven pumpkins with frightening facial expressions. Six of the pumpkins were 4 inches in diameter and the seventh, which hung in the middle of the string, was 6 inches. The pumpkin lanterns were lit by intermediate base lamps, which because of the heat created, served to greatly shorten the life of these wonderful decorations. 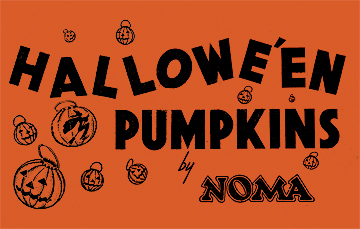 In the early 1950s Noma again marketed a Halloween Jack-O-Lantern set. The construction was a form of early hard plastic and featured an incised face and painted witch, and had a plastic handle. The pumpkins were 3" in diameter and had a snap-in ring for holding an electric lamp. Sets of 8 pumpkins were sold for use with miniature base series lamps, and sets of 7 were made for use with candelabra base multiple lamps. These sets were marketed in a very attractive box with an orange lid and simple graphics. Electrical decorations are not limited to those which plug into the wall. It was a simple process to adapt decorations for battery use. The Pulpco Company of Milwaukee, Wisconsin seems to have been the first to take a paper mache pulp lantern (which was intended to use a candle) and affix a pasteboard top with battery holder and lamp. Other companies, among them the Miller Electric Company of Pawtucket R.I., sold hard plastic J-O-Ls that lit by means of a battery. This form of decoration was available in a variety of sizes. The 1950s also saw the advent of the battery operated toy lanterns. The lanterns which featured a celluloid head and tin base appeared first. These were available in the form of a red devil, a Jack-O-Lantern face, and an ugly, long-nosed witch. Later, lanterns with glass globes made their appearance. A variety of Jack-O-Lantern faces, as well as a skull, and owls were very popular with their blinking lamps inside. There is also a variety which features a hard plastic J-O-L globe. With the coming of softer plastics, Halloween light-ups were produced by more companies. The Peerless Electric Company marketed a string of three skulls and one of three pumpkins. These were on an orange and black electrical cord and lit nicely. During the 1960s "light-up" vinyl wall plaques made their debut. These had various embossed Halloween scenes and were painted on a vinyl formed shape with a cardboard backing. The General Electric Company produced a G40 light bulb just for Halloween. The bulb is a 5 inch globe with a standard base and is painted orange with a grimacing face on both sides. The unique thing about this bulb is that the face is painted so as to look correct whether it is used in a base up or base down mode. Hard plastic candles with softer plastic Halloween heads were sold about this time. These had either a devil, skull, or J-O-L on an 8 inch tall black plastic candle stick. These were short lived and gave way to even softer plastic decorations of the 1970s which were vacuum formed Halloween figures including ghosts, J-O-Ls, and haunted houses. Most of the electrified Halloween decorations were made in the USA. Japan and Hong Kong accounted for the later lanterns, and Taiwan exported a variety of items. Very few early pieces can be found which were made outside of the USA. Included in these are a table lamp made in Germany; having a light under the lamp's crepe paper skirt. Other oddities such as flashlights, blinking hats, and lapel pins can be found. As a rule, the Halloween decorations which are illuminated are a very small part of the known Halloween decorations, and the early ones are very scarce.